If you’re looking for weekday family fun, great prices and quality entertainment, Putt-Putt FunHouse is the place for you. Putt-Putt FunHouse provides both indoor and outdoor attractions the whole family can enjoy. Add some fun to your week by checking out The FunHouse’s daily specials. Each day of the week is filled with different attraction specials and deals. From Putt-Putt Golf and Bumper Boats to arcade games and Laser Tag, these daily specials have something for everyone to enjoy. Start the week off with deals on everyone’s favorite attractions. Every Monday at The FunHouse, $12.95 per person includes unlimited Putt-Putt Golf, a $5 Play Card and a choice of two attractions. The attractions to choose from include Hologate Virtual Reality, Laser Tag, Bumper Cars, Bumper Boats, 3D Motion Theatre, Rock Wall, Ballocity, Mini Bowling, Laser Frenzy and Time Freak. 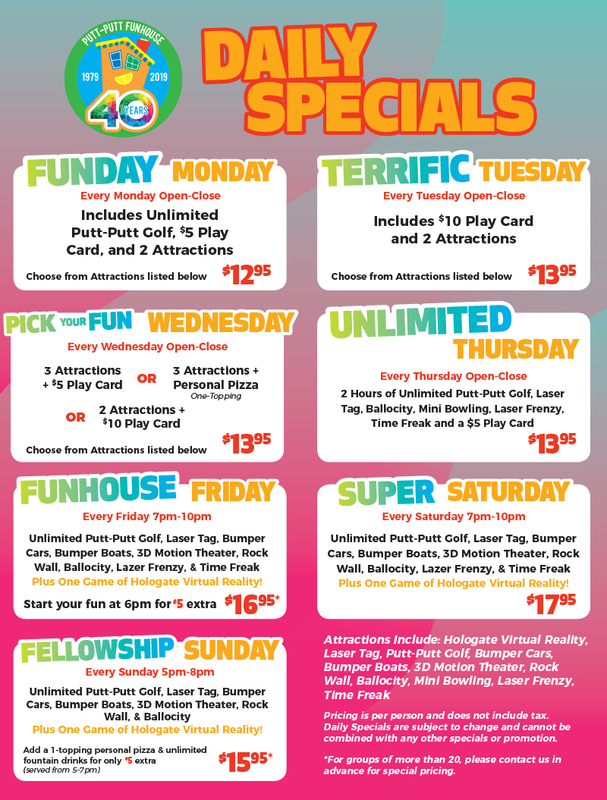 Terrific Tuesdays at Putt-Putt FunHouse are $13.95 per person and include a $10 Play Card and a choice of two attractions, including Putt-Putt Golf. Whether you’re looking to ride some rides, play in the arcade or dine at the FunHouse Café, Pick Your Fun Wednesdays have a special option for you. Every Wednesday from open to close a price of $13.95 per person comes with three options, either three attractions and a $5 Play Card, three attractions and a personal pizza or two attractions and a $10 Play Card. For a full day of fun, check out The FunHouse’s Unlimited Thursdays, from open to close every Thursday a price of $13.95 per person includes two hours of unlimited Putt-Putt Golf, Laser Tag, Ballocity, Mini Bowling, Laser Frenzy, Time Freak and a $5 Play Card. There’s no better way to start the weekend than with a fun family evening out at Putt-Putt FunHouse. Every Friday from 7pm to 10pm, $16.95 per person includes unlimited Putt-Putt Golf, Laser Tag, Bumper Cars, Bumper Boats, 3D Motion Theatre, Rock Wall, Ballocity, Laser Frenzy, Time Freak and one game of Hologate Virtual Reality. If your family is hoping to have some weekend fun, the specials are still available every Saturday and Sunday. On Saturdays from 7pm to 10pm, a price of $17.95 per person will include unlimited Putt-Putt Golf, Laser Tag, Bumper Cars, Bumper Boats, 3D Motion Theatre, Rock Wall, Ballocity and one game of Hologate Virtual Reality. The same specials are available every Sunday from 5pm to 8pm for only $15.95 per person. The FunHouse also offers a Play All Day pass available Monday through Friday for $12.95 per person. This pass includes Putt-Putt Golf, Ballocity, Mini Bowling, Laser Frenzy, Time Freak and a $5 Play Card. This promotion is perfect for the little ones in the family who aren’t yet in school. Switch up your weekly routine and head to Putt-Putt FunHouse for great deals and quality time with your favorite people.